I had a lovely time at Champneys Tring the other week, filming some videos that I had wanted to do for ages on at-home spa treatments. This is the first video and (with the help of wonderful Katrina) I look at ways that we can make our cleansing routine more luxurious and spa-esque. Obviously you won’t have time to follow these steps every day, but as a weekly treat I think that they work extremely well. Of course if you allow yourself a certain amount of pampering time on a daily basis, be my guest and cleanse like this all of the time! In this video I’ve concentrated on cleansing balms because I think that they have a luxurious ‘slip’ to them that allows for lengthy massage and indulgent shut-eye sessions. They don’t dry out on the skin (due to the oils) so you can leave them on for ages before removing. I have three that I use regularly, I’ve popped the info below the video pane. I hope that you find the techniques and massage movements useful – I have started incorporating them into my routine and they make for a nice little ritual. 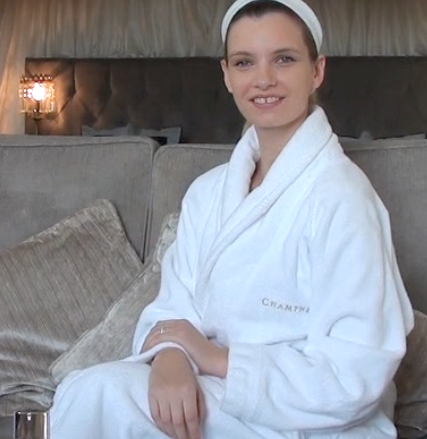 Thanks so much to Champneys for sponsoring this video, for allowing me to film in the beautiful Princess Suite and for lending me the amazing Katrina!